Sensational maquette of the lovely matriarch from The Munsters. 1:6 scale limited edition statue measures 11 1/2-inches tall. Welcome to 1313 Mockingbird Lane! Bearing a flame for her odd but loveable family, Lily Munster keeps everyday life in order at 1313 Mockingbird Lane in the 1960s TV series The Munsters. 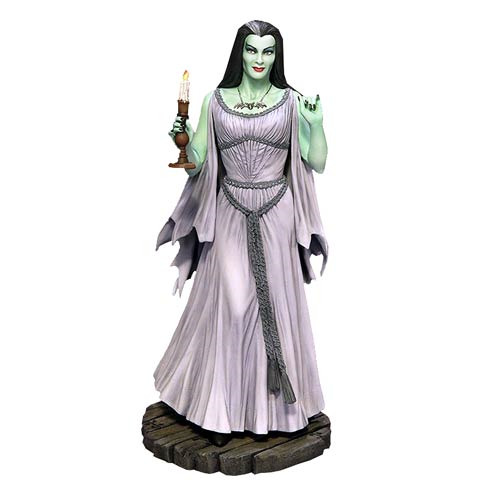 She can do the same for you in your humble abode should you acquire this extraordinary cold-cast porcelain The Munsters Lily Munster Maquette Statue. The second release in a series of deluxe limited edition maquettes, Lily stands 11 1/2-inches tall in 1:6 scale. Ages 14 and up.